Our final stop in New Zealand was the city of Christchurch. 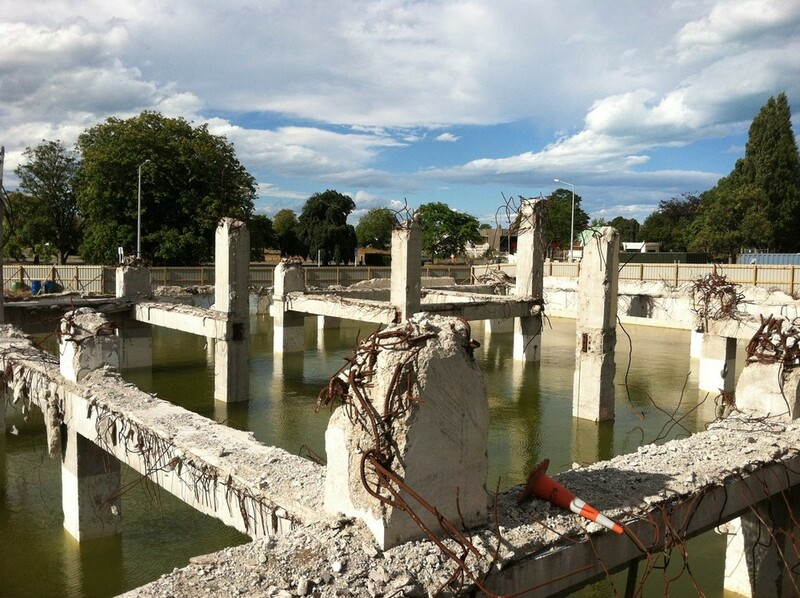 Though the city has much more going on than just being an earthquake city, the Canterbury earthquakes are a compelling topic and the destruction was such a pervasive force in the city to our touristic eyes. And as two urban dwellers like us, and residents of a city that's rebuilt (and rebuilding) from two major destructions in the past 15 years, seeing a another city smack in the thick of it was fascinating and powerful. First of all, a little background: Christchurch is the largest city on the South Island of NZ, and the country's 2nd largest city overall. Though relatively small in population compared to American cities, it's still a very real city. It has a lovely downtown (or CBD, as they call it) with a mix of historic buildings and tall, modern towers. Perched on a little peninsula in the Pacific ocean, and not on a fault line, no one ever expected Christchurch to bear the brunt of a major earthquake. Let alone two. Most of us probably remember the news coverage of the Christchurch earthquakes. But I hadn't realized just how bad it STILL is. It's not surprising--just like Kiwis heard about Hurricane Katrina, or Superstorm Sandy—once the world news stops paying attention to the immediate crisis, it fades from the consciousness of those not within the radius of devastation. How much have you heard about the Haitian earthquake victims lately? Do you think everyone affected is back to normal? In case you are thinking to yourself “New Zealand had a major earthquake? Oh, yeah....” (And I admit, I kind of thought that...) here's the quick n' dirty version of what shook down, no pun intended. And if you know a lot about the Canterbury earthquakes, you may want to skip ahead three paragraphs. So.. in September 2010, a major earthquake hit the Canterbury region of NZ, which is the westerly suburbs of Christchurch. It was a biggie: 7.1 on the Richter scale. But, because it hit in the middle of the night and the epicenter was located in a mostly rural area, the damage was minimal and there was no loss of life. It was an amazingly close brush with disaster, one in which the city came out essentially unscathed. Phew. As I mentioned before, the city isn't on a fault line (in fact, the New Zealand fault line runs clean across the other side of the country) so the 2010 quake was wholly unexpected. The city wasn't prepared or fortified like other quake-ready cities are, which is why they were so surprised and relieved when the first quake left them unharmed. But then the unthinkable happened: A second quake. Just five months later, in February 2011, on a Monday at around noon, the city was rocked with a 6-point-something quake. This time, the epicenter was just 3 miles from the central business district. And it was supposedly a very intense quake. Coupled with a ridiculous number of strong aftershocks--seriously, like 100+ aftershocks were recorded in the months following, more than 30 over 5.0 magnitude--it was all just too much for the already weakened buildings of Christchurch. It was a 1-2 punch that much of the architecture could not sustain. Buildings crumbled, windows blew out, and within just a few minutes, an entire city was left in ruins. The second quake also had a deadly toll. The entire city was awake and bustling about as cities do at lunchtime on a Monday. 186 people were killed, and more than 11,000 were injured, making it New Zealand's second deadliest natural disaster. You're probably thinking 186 people isn't the kind of tragic deal toll you hear about from major quakes and tsunamis, right? In finite terms, yes, it's not as bad as the Haitian quake or other major earthquakes. But compared to the population of New Zealand, it's very serious. We did the math, and the relative population loss for NZ was huge. It would equate to a population loss of 12,000 people in the U.S. Can you imagine the devastation of an earthquake that killed 12,000 people in California? It would be the disaster of a lifetime. Many lifetimes. So fast forward to February 2015. It's been four years since the quake. And the city looks like the it all happened four months ago. The downtown area is ghostly. More than 50% of the buildings are empty. Scaffolding covers the city like quickly applied band-aids on a fresh wound. Instead of sky-scrapers, the skyline is filled with the silhouettes of construction cranes. Crumbly streets are lined with orange-cone polka dots, but it doesn't matter much because there is barely any traffic in the city anyway. In the daylight, the damage was so exposed. Everywhere we looked there was evidence of the ruination. An empty dirt lot where a building once stood. A row of boarded up storefronts. Once glossy office buildings, abandoned by their tenants and now graffitied. A sign that read “Not open public—Site unsafe”. But at night, it was even eerier. The streets were lifeless, and skyscrapers towered over us in complete darkness... not a single light flickered inside, because not a single person has been inside for four years. 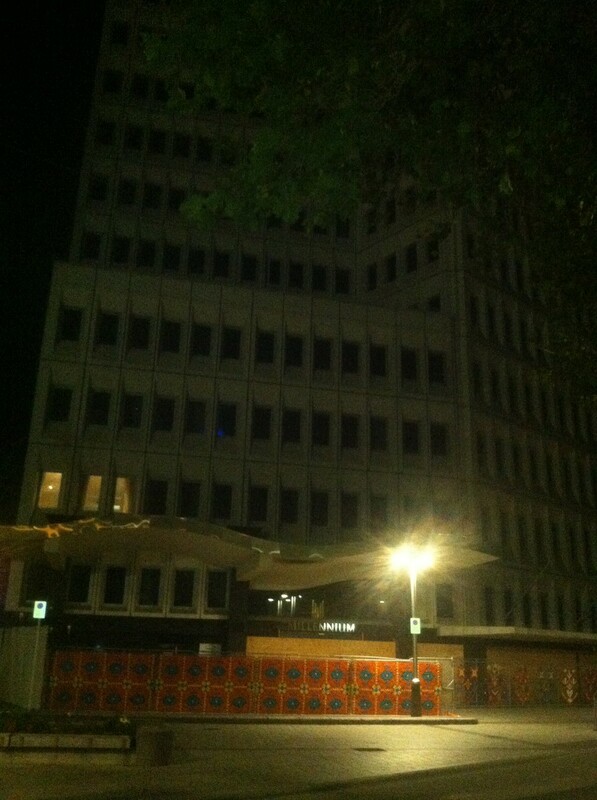 We saw these bastions of destruction, the abandoned hotels and office buildings, with their unlit signs still adorning the top reading “Hyatt” and “Whitcoulls” and wondered... Are there still beds inside the hotels? What about the offices? Are there framed photos of children still sitting on top of desks? Did they leave it all behind and just run? The city's main square, Cathedral Square, is the heart of the city and therefore the biggest heartache. 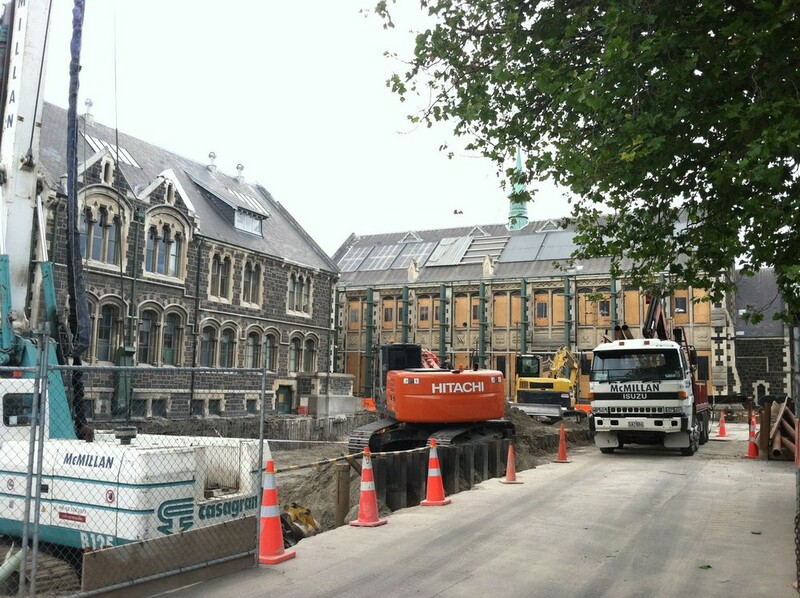 The beautiful ChristChurch Cathedral, the oldest city building, is now hidden behind tall scaffolding--but it's possible to peek through and see the disfigured behemoth. What an awful sight. The entire front face of the church had fallen off, ripping its delicate innards wide open... exposing the stained glass window and the underbelly of it's roof, and now all held up by metal truss supports, architectural crutches. It felt wrong to look at it for too long, like gawking at a person who'd been a terrible car accident or a burn victim with a scarred face. I took a few photos, but didn't feel good about it. On the other side of Cathedral Square is the city's visitor's center. It's a beautiful brick building with a large 2-sided clock tower. 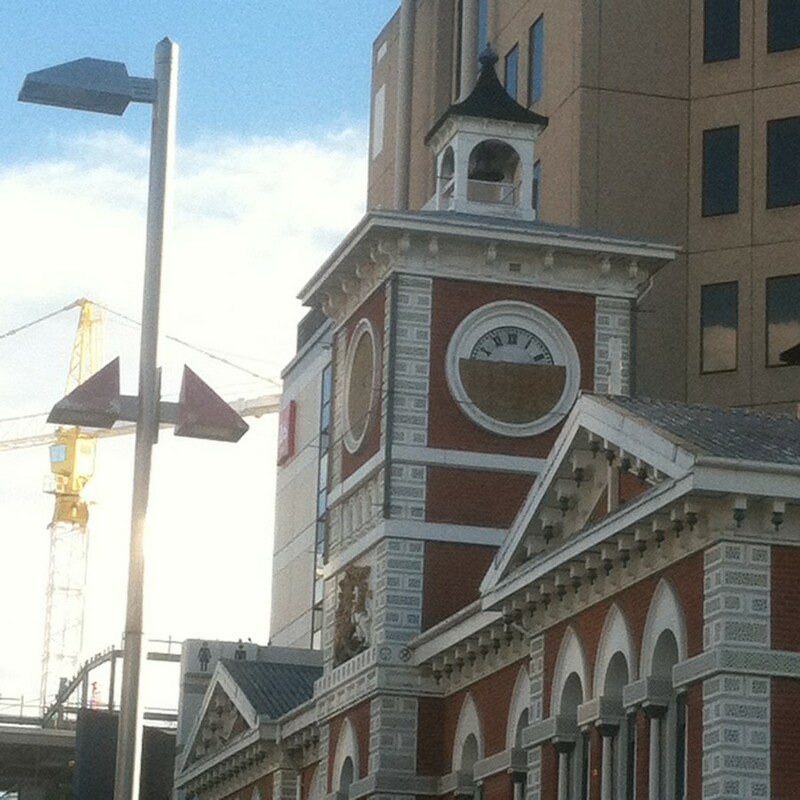 Badly damaged from the quake, the clock doesn't run. 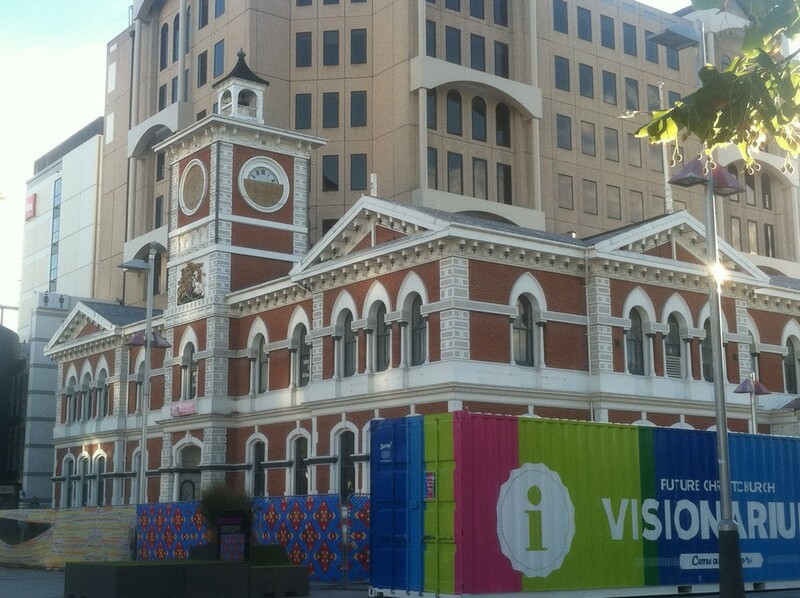 The clockface is boarded up partially on one side, and just lays broken on the other. Quite fittingly, it makes it feels as if the quake just made time stop. But of course, time hasn't stopped. The city is rebuilding and rebounding. And Christchurchians are amazingly resilient and industrious. 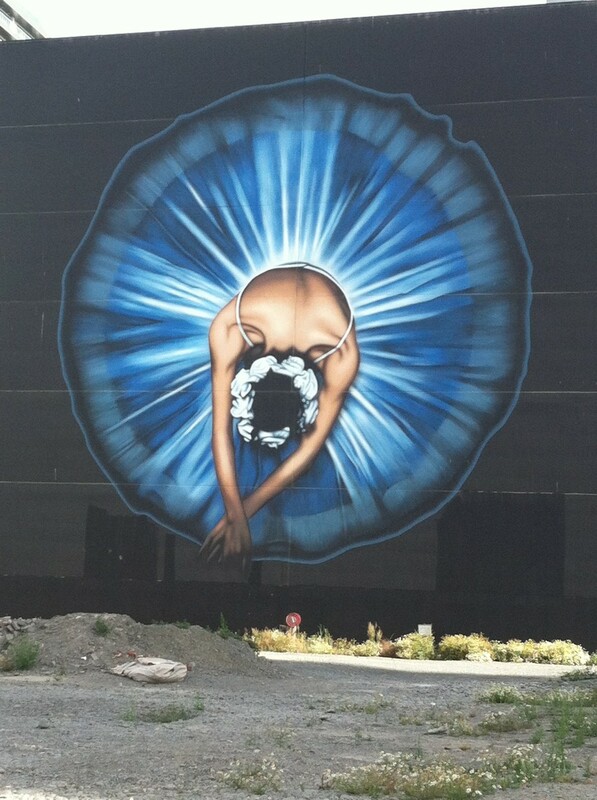 Artists are using empty buildings as giant canvases, so the streets are vibrant with new murals. Large-scale art installations have augmented the city squares, including a giant wall of outdoor flags that mimic a pattern within the tatterdemalion cathedral as a tribute to the great building. And the new heart of the city is the city-sponsored “Restart Mall”. About 50 shipping containers have been painted brightly and re-purposed to create a cool pop-up/semi-permanent al fresco market. Tiny shops packed with funky wares surround coffee shops, outdoor cafes, and food trucks. It features outdoor living spaces made from upcycled quake debris. There was a sign that read “Greening the Rubble.” Indeed. And they are even finding ways to generate revenue from what happened. The city has created an Earthquake Museum to educate visitors (with a fairly hefty entry fee.) And there are earthquake bus tours that take visitors to earthquake sites to see first hand. We didn't do any of these activities, mainly for budgetary reasons but also because it felt a bit like rubbernecking, but you have to hand it to a city trying to rebuild a limping tourism industry. Whatever they can do that works. They need paying butts in seats. 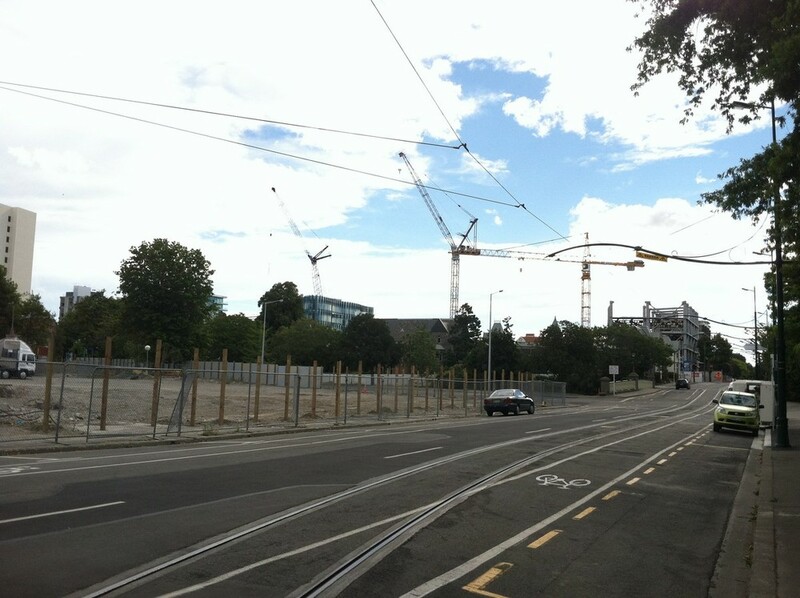 Another bright spot: Christchurch's amazing greenspaces went largely undamaged. The city has a lovely little river winding through it with a small parkspace on the banks, as well as their crowning jewel park: their botanical gardens. It's free and wholly impressive. There is a rose garden that puts all other rose gardens to shame. Imagine a huge octagonal garden with concentric flower beds each overflowing with a different color and type of rose. It was a rainbow of roses, and it was all in bloom when we were there. Even Chris found the garden truly enchanting... and boys don't usually get wowed by rose gardens, right? I can't pretend to know much about the specifics of how Christchurchians have suffered. But I do know, from talking to a handful of Kiwis, that many residents just had to leave. Much like Katrina, it sounds like a lot of folks relocated because it was too damn hard. They got tired of waiting for insurance money. They didn't have a job. They felt scarred from the experience of two quakes. 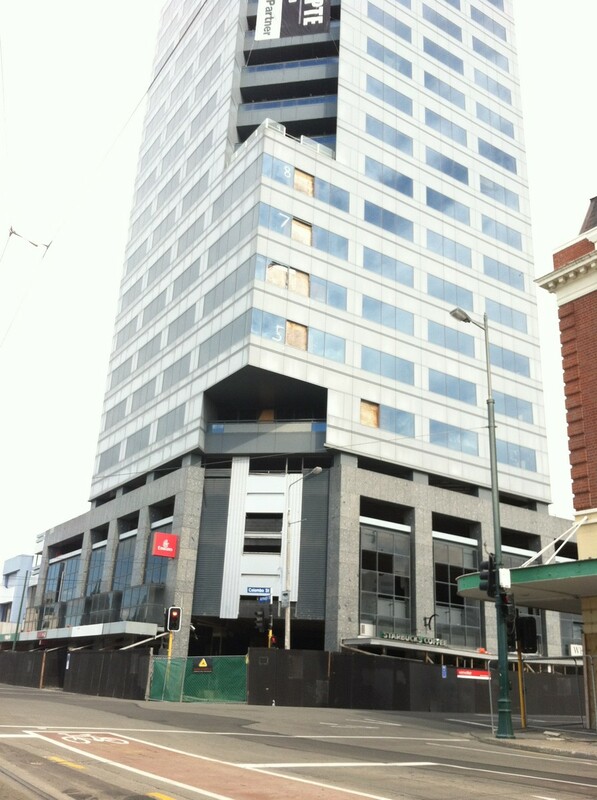 And I also could say that walking through the streets of Christchurch had a very downtown-NYC-post-9-11 feel to it. And that made me sad for them. Because I know that was a dark time for my city, and I can tell these four years have been a dark time for theirs. We know that the city is working on it. Who knows why it's taking so long. Lack of funding? Lack of leadership? Not enough architects? I'm not sure. We did some cursory research and what we read was that it's just been THAT bad. There was a yearlong swarm of aftershocks causing continual damage. Some parts of the city sank up to 3 feet, causing flooding. And they had to completely replace most of the freshwater and wastewater pipes in the city. 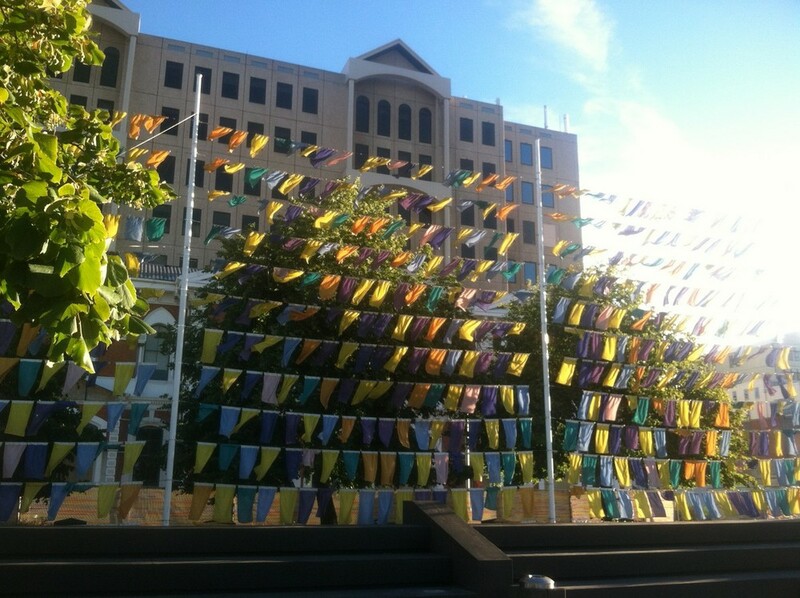 But it's clear from all of the initiatives and artwork and yes, even the endless construction noise that fills the air, that Christchurch is a city in full-on regrowth mode. Newer PostWe live in a van down by the river.